Conventional oil and gas wells are "hydrofracked" just like wells utilizing high-volume horizontal drilling. The difference is that conventional drilling sites require tens of thousands of gallons of fresh water mixed with chemicals injected under explosive pressure, and high-volume horizontal drillers require millions of gallons. Another difference is that conventional drilling generally involves one well per site, but horizontal drilling involves several, sometimes a dozen or more wells at one site. Drilling can go on for much more extended periods of time. But most importantly, the waste management problem is far greater for horizontal drillers. Most of the injected water, chemicals and natural brine underground is returned to the surface and must be disposed. Liquids and solid waste (drill cuttings) brought to the surface from horizontal drilling are between 25 and 1,000 times more radioactive than background (and background includes elevated radiological exposure to past nuclear test fallout and fallout from the Cherobyl accident). Radioactive waste and runoff from fracked drilling sites is recognized as a serious issue by the industry--so serious it has pressured New York regulators to avoid regulating it. A lawyer representing Chesapeake Energy urged regulators to "reduce or eliminate radionuclide testing" of stormwater runoff, according to emails obtained by the Environmental Working Group in June 2012. On January 12, 2011, NYSDEC Deputy Commissioner Eugene Leff testified at a state Senate Standing Committee on Energy Conservation, Public Hearing to examine waste water produced by hydraulic fracturing, that “concentrated radiation” can be found in the waste residue left after closure of a waste water holding pond, including the sediments, liner and any remaining liquid. (see 1:01:36-1:02:52 of the video of the hearing posted by shaleshockmedia.org. Radioactive drilling wastes from Marcellus gas well sites in Pennsylvania are currently being disposed in New York landfills, including the Hyland Landfill in Angelica, the Hakes C&D Landfill in Painted Post, and the Chemung County Landfill. Since they began accepting marcellus Shale drilling wastes from Pennsylvania in 2010-2011, stormwater runoff and leachate from the Hyland and Chemung landfills have become elevated in radioactivity. That radioactivity is being discharged untreated into the Genesee River and the Chemung River. High-volume horizontal fracking is effectively banned in New York. 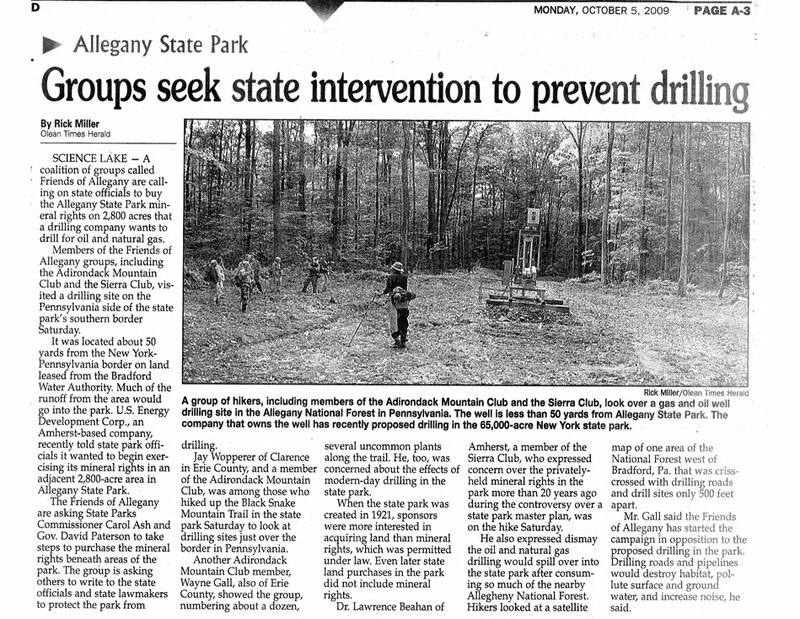 Under DEC's proposed regulations to allow it, well sites can be located as close as 500 feet apart, can be as clase as 500 feet from a home and, if the developer controls 60% of a 640-acre drilling unit that includes your property, horizontal drilling beneath your property and potential groundwater and surface water pollution cannot be stopped (this is called "compulsory integration" into a drilling unit). A public comment period on DEC's plan closed on January 11, 2012. EPA, New York City's environmental protection agency and several others stakeholders found the plan is seriously deficient and needs to be rethought to address several neglected issues, including how the waste will be managed. We'll post here links to resources you need to understand what's at stake. CCCC volunteers are currently sampling area streams monthly to obtain baseline (clean) water quality data to compare to future water quality should fracking begin here. For more on this program, click on "Water Sentinels" to the left, go to "General Info." For a look at what high-volume hydrofracking would mean in Cattaraugus County, one need only look at a map of Bradford County, PA prepared by the gas industry, showing the concentration of water withdrawal and impoundment sites, gas pipelines, water lines, and gas well drilling sites. 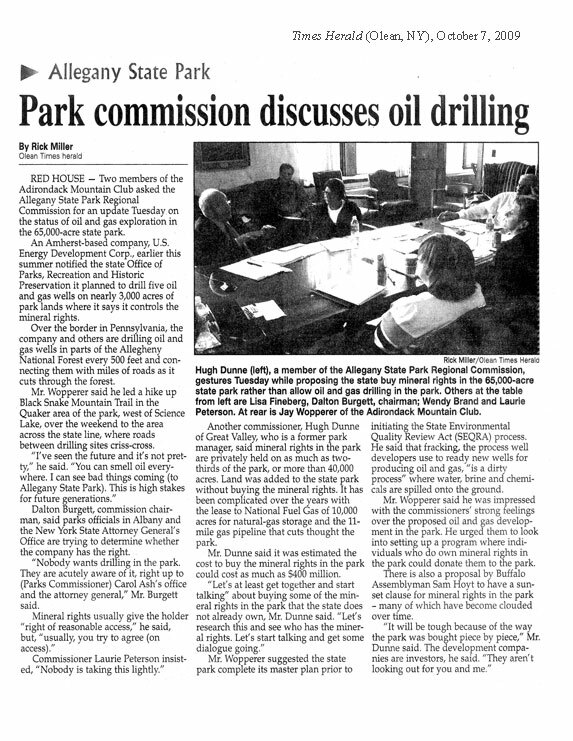 An excellent account of environmental contamination and methane emissions at Pennslyvania frack sites is in Edward Humes' July-August 2012 article, linked to the left. It turns out that release of gases into the atmosphere during the development and processing of shale gas on site, after factoring in emissions reductions that result from transitioning from coal to natural gas, causes more warming of the climate, not less. No environmental benefit can therefore be expected from the growth of the natural gas industry. Concerns have been raised about the ability to obtain a mortgage or re-finance a mortgage on leased property, and the lost tax revenue to localities if leased property is devalued. (See at left, "Houses for shale".) In Pennslyvania housing shortages have resulted from boom-town conditions. (See at left, "Housing problems".) Gas developers lease land rather than obtain title by purchasing the land. They do that in order to avoid liability for clean up costs later. Currently hydrofracking is exempt from most federal environmental laws. That's why it is so important that DEC get it right in New York: only states can meaningfully regulate this industry. Two County Supreme Court judges have ruled that New York's Oil, Gas and Solution Mining Law, governing fracking, does not preempt local zoning laws that ban or restrict the location of such practices. NYS Dept. Envtl. Conservation info. 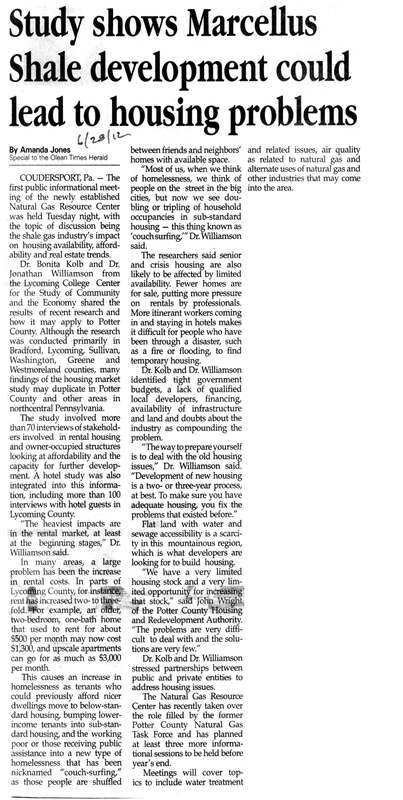 "Houses for shale," Pike County Courier (Milford, PA) (June 3, 2010) -- there is "a long list of banks that won’t fund leased properties, based upon environmental risk," and evidence that value declines for leased properties, raising concern about "how much we have lost in revenue from property and home buyers who made use of local services, frequented retail shops and restaurants and hired local contractors for building and remodeling." Gasland - Academy Award nominated documentary, focusing on the Pennsylvania experiment. "People here are sick" - Wyoming survey of residents living near natural gas wells shows more 90% have health effects consistent with exposure to fracking chemicals. 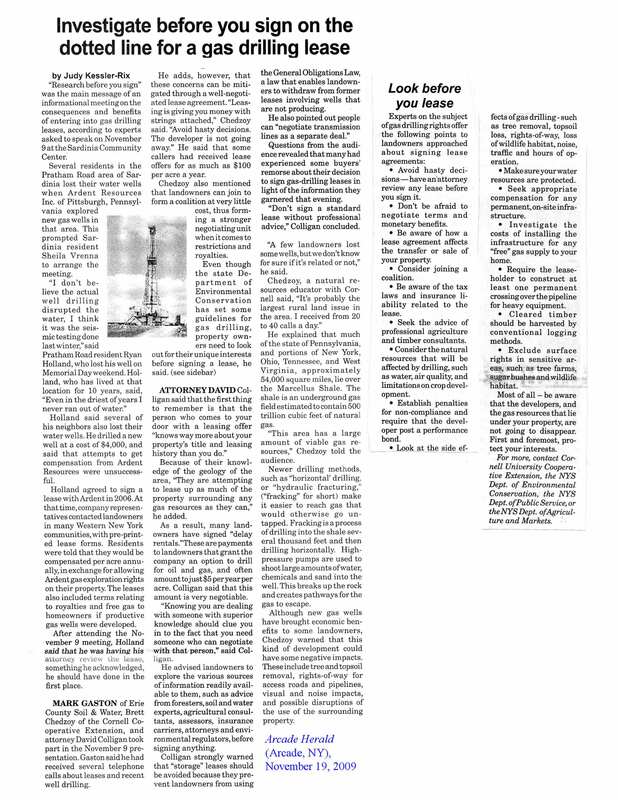 Solve Climate News, August 23, 2010. "New York state has moved into a bi-partisan moratorium on fracking, Quebec has imposed a de-facto moratorium on shale drilling, the Maryland state house is on the verge of passing a similar moratorium, 20,000 protesters marched in France last week against shale drilling, Australian farmers are revolting and locking their gates against gas exploration, the New York Times reported that radioactive gas drilling waste was being dumped directly into Pennsylvania’s drinking water sources, the Pulitzer Prize-winning Pro-Publica news organization reported thousands of cases of contamination across the country, CNN and 60 minutes has reported numerous case studies on families whose health have been harmed and whose water has become undrinkable due to drilling . . ."